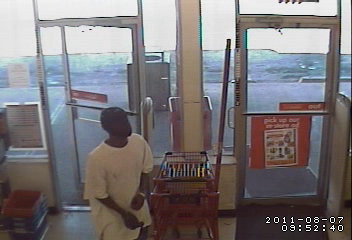 Kansas City Police need your help to find the suspects who robbed a Family Dollar Store in South Kansas City. On August 7th at about 10:52am, the first suspect entered the Family Dollar Store located at 6827 Longview Rd brandishing a handgun. 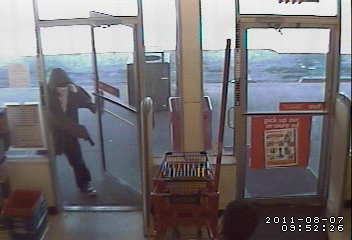 A second suspect entered behind him, and they ordered the clerk to empty the registers, and put the money in to a bag. A get-away vehicle pulled in front of the business, but an armored car arrived, so the get-away vehicle pulled away. The suspects inside the business saw the armored car, and ran to the back of the store, where the exited out of the emergency exit. Suspect 1: A black male between 18 and 25, wearing a black and gray striped shirt, brown hoodie, black jeans, and covering his face with a white t-shirt. He was approximately 6' to 6'02", 160-175 pounds. Suspect 2: A black male between 18 and 25, wearing a white t-shirt, blue jeans, and a black baseball cap. He wore pantyhose as a mask. He was approximately 5'10" to 6'02", 145-175 pounds. Suspect 3: and unknown black male driving a black or dark colored late model Chevrolet HHR with out of state plates. Anyone with information is urged to contact the TIPS Hotline at 816-474-TIPS (8477).